The organic ties between the U.S.-backed YPG and the U.S.-designated terrorist group PKK surfaced once again on Monday, as Zozan Temir, a terrorist once in the ranks of the Syrian affiliate of the separatist group was killed during Turkish anti-terror operations in southeastern Turkey. 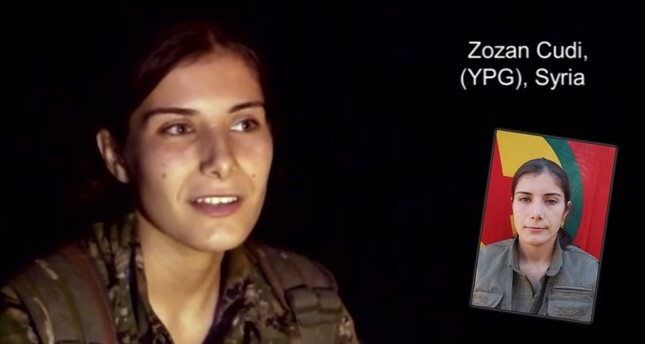 The 24-year-old Syrian from Qamishlo first joined the ranks of the YPG four years ago, as she mentioned in a video circulating on social media. In recent anti-terror operations, a female terrorist among the ranks of the PKK was killed in Turkish territory, and her identity was revealed by Turkish security forces as Zozan Temir. Her real identity was also revealed in PKK-linked websites along with the nom de guerre she used, Zozan Cudi. Turkish officials have reiterated countless times that the YPG/PYD is no different than the PKK, a globally recognized terrorist group. Even though the terrorists in Syria have done everything to prove they are the same as the PKK, going as far as displaying the poster of Abdullah Öcalan - the leader of the terrorist group - in Raqqa, the U.S. still has not disengaged with them even now that Raqqa is free of Daesh terrorists.